We’d love your help. Let us know what’s wrong with this preview of Puppy Love by the Sea by Traci Hall. Sarah Murphy champions the underdog in her shelter by the sea, fighting against designer puppy mills and greedy breeders. Franco de Silva is a wealthy single dad looking for a place to heal. He invests in a puppy store, which comes with Sarah, a blonde animal control officer hell bent on shutting him down. Sarah sees suave and e An alternate cover edition can be found here. To ask other readers questions about Puppy Love by the Sea, please sign up. Have you ever started a book and within the first few pages, it was a winner. Puppy Love by the Sea by Traci Hall was one of those books for me. Choosy Bookworm introduced me to this book, and all I can say is THANK YOU! Ms. Hall is a new author to me, and this book will keep me coming back. I absolutely loved it. It is a phenomenal book of love, between a father and his daughter, between a woman and her pets, all rescues, and of course between Sarah and Franco. Franco de Silva reopened the pet s Have you ever started a book and within the first few pages, it was a winner. Puppy Love by the Sea by Traci Hall was one of those books for me. Choosy Bookworm introduced me to this book, and all I can say is THANK YOU! Ms. Hall is a new author to me, and this book will keep me coming back. I absolutely loved it. It is a phenomenal book of love, between a father and his daughter, between a woman and her pets, all rescues, and of course between Sarah and Franco. Franco de Silva reopened the pet store that had previously been selling "puppy mill" puppies. Sarah had spent six months getting the store shut down. Sarah is the animal control officer for her small town. She takes her job very seriously. She does a surprise visit to de Silva's Diamond Dogs, and while the gives him a warning citation for a bucket of cleaning water being out. Sarah and Franco did not start out well, but along the way things change. If you like to read contemporary romance books, read this book. I hope you love it half as much as I did. Thank you for reading my review. Thank you Ms. Hall for the gift of this book, I will be reading other books mentioned at the beginning and end of this one. You have a winner with Puppy Love by the Sea! I thoroughly enjoyed Puppy Love By The Sea! Traci Hall weaves a story of romance, the love of animals and, as she likes to say, a happy ending. I highly recommend this feel-good book. Charming, flirty story. Franco and Sarah got off to a rough start; adversaries and hostile after a misunderstanding of sorts. She had just outsed a puppy mill type business after a six month fight. When Franco bought the space and opened up a designer dog business, she thought he was just more of the same. Not a good way to start; looking for trouble and issuing a citation right off the bat. Franco was gorgeous, rich and hot; all things that made Sarah distrust him even more. Now his daughter, B Charming, flirty story. Franco and Sarah got off to a rough start; adversaries and hostile after a misunderstanding of sorts. She had just outsed a puppy mill type business after a six month fight. When Franco bought the space and opened up a designer dog business, she thought he was just more of the same. Not a good way to start; looking for trouble and issuing a citation right off the bat. Franco was gorgeous, rich and hot; all things that made Sarah distrust him even more. Now his daughter, Bella was a totally different story; they hit off right away. After a Thank you dinner that Franco begrudging offered, he began to see Sarah in a whole different light. He began to want what he saw was the true Sarah. She considered herself "Just Sarah", what you see is what you get. He began to desire her because she just began to light up his life even when she was all independent and all. Sarah's passion was rescuing unwanted animals and Franco's passion was cooking as a chef and his daughter Bella. But as more time went on he wanted to include Sarah as his passion. She kept saying, only friends but he wanted so much more. Sarah figured he was waaaay out of her league. Sarah's mom is an interesting addition to the story as is her employee/friend Martin. There is a HEA for them of course but before that there is food, laughter, animals and some fighting. Can they work as a team? The HEA says they can, but Franco has his work cut out for him. So to be honest I would have definitely paid for this book just from reading the summary because it drew me in with all my favorite things from and I was not disappointed! This is a romantic story of an independent women with a strong passion for pets and helping save those that have been mistreated or just homeless.As if that wasn't good enough she also rescues Pit bull mixed breeds, also close to my heart as I also adopted my I was given a free copy of this book in exchange for an honest review. This is a romantic story of an independent women with a strong passion for pets and helping save those that have been mistreated or just homeless.As if that wasn't good enough she also rescues Pit bull mixed breeds, also close to my heart as I also adopted my pit bull mix 2 years ago from a shelter. Then there's a hot single dad that happens to be rich that catches her attention. I received a copy of this book for an honest review. 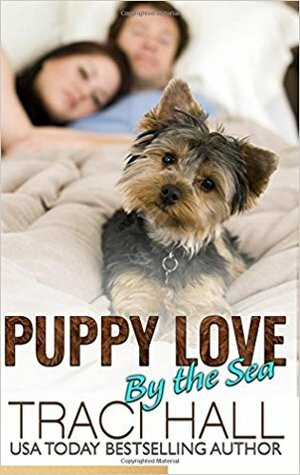 "Puppy Love by the Sea" is a really cute, sweet, and fun book. If you love animals, romance, family, and a community that pulls together this book is for you. A great read for the beach or when you need to escape for a while. Traci Hall does a great job of pulling you into the story. I really enjoyed this book. I look forward to reading other books by Traci Hall. What a cute little book. This was a fast read, it only took me a couple of hours. I started reading this late at night, and stayed up until I finished it. The two protagonists in this story both work with animals. Sarah owns an animal rescue company, and Franco owns a pet store. The two are at odds in the beginning of the book, but soon they start to fall in love. This is a great book for animal lovers, and there is also a nice romance story. I received this book for free in return for a honest review. This book is wonderful. You have your main characters fighting an attraction. They come together to attempt to save an animal shelter. Get the book read it see what happens. What a great story. I truly loved the characters. Franco seems to be the perfect fit to the independent Sarah. Franco's daughter Bella is cute and funny. I found the book a pet relayed romance. This was a very sweet read. I am recovering from surgery and it helped me pass the time. I will definitely read more by this author. I loved this book. It has romance and the animals are part of the story not just a character that you hear about once. My strong woman is here and ready to show anyone that she means business. There is an adorable character in this book and I don’t mean the child or the animals. Although the animals come in second for me. Being an animal lover I think this was an awesome book by Traci Hall. I really enjoyed this book. Sarah is trying to take care of the animals that need to be taken care. She is a very caring young lady who has the biggest of hearts. Sarah is a very independent woman and likes to do things her way without getting help from anyone else She is trying to run a no kill shelter for pets of all types. She tries to find them homes. She is in fear of losing her business because she needs a new roof and ca Being an animal lover I think this was an awesome book by Traci Hall. I really enjoyed this book. Sarah is trying to take care of the animals that need to be taken care. She is a very caring young lady who has the biggest of hearts. Sarah is a very independent woman and likes to do things her way without getting help from anyone else She is trying to run a no kill shelter for pets of all types. She tries to find them homes. She is in fear of losing her business because she needs a new roof and can not afford to get one. However with her pride and independence she does become offended if someone offers to fix the problem for her. Franco De Silva has opened a new pet store in the same spot where another one had been. However, the old pet store was shut down by Sarah because of the way they did things. Franco De Silva is about to show Sarah how it is to help each other. I really don't want to give the story away but it is an awesome book and I really think you will enjoy reading it. Be sure to get you a copy today and check it out. If you want an easy read for a lazy afternoon, this is it. If you enjoy animal rescue stories, even better. Sarah has a heart for animals in need. She started out at an early age when she found a stray dog. She searched for its owner but didn't find them in time to save the dog from euthanasia. You know a romance is always going to have a happy ending but getting there can be bumpy, This book had some wonderful bumps along the road - misconceptions about each other was just the start. But with puppies, kittens and an adorable little girl in the mix it was a wonderful trip. I really enjoyed that true emotional interaction between the main characters was what drove this book forward. "I received a free copy of the book in exchange for an honest review." Lucille is working at the church when the body of her brother-in-law slides out of the confessional and lands in her path. First her daughter's boyfriend is arrested, and then someone even closer to her. Lucille starts to investigate the crime on her own and what she uncovers is that people have been keeping a lot of secret. Can she get down to the bottom of what really happened? An interesting mystery. A funny fast paste love story about a couple who start off disliking one another due to a mistaken opinion and end up realising that pride is a poor bedfellow.